The following biography of General Pickens is from the USDA Forest Service web site. An able commander of South Carolina rebel militia during the American Revolution, Pickens was born near Paxtang, Pennsylvania, of Scots Irish immigrants. His family moved south to the Waxhaws with other Scots Irish families in the mid 1700s. 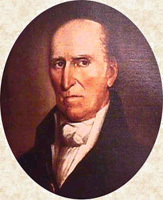 Andrew Pickens served in the Cherokee War of 1760-1761 and was an officer in a provincial regiment that accompanied Colonel James Grant and British regulars in an expedition against the Lower Cherokee towns in 1761. He moved in 1764 to the Long Cane Creek settlement in Abbeville County where he married Rebecca Calhoun, aunt of John C. Calhoun. In 1768, Pickens built a blockhouse at the future location of Abbeville, to defend against Indian attack and to serve as his base for the Indian trading business. Pickens, an elder in the Presbyterian Church, was described as a severe, dour, Scots Irishman of few words. He fathered six children. Much of his future wealth was built on trade with the Cherokees. He was also a farmer, justice of the peace, and church leader at the outbreak of the Revolution. He became a captain of rebel militia under Andrew Williamson at Ninety Six in 1775 and took part in the 1775 Snow Campaign against loyalist militia in the piedmont. A majority of the settlers in the back country remained loyal to the king or did not support rebellion. The Cherokees attacked several settlements along the frontier and killed many settlers in July 1776. Captain Andrew Pickens led militiamen from the Long Canes in Williamson's expedition to burn the Lower Cherokee towns in northern South Carolina. The settlements of Essenecca (Seneca), Tomassee, Jocassee, Estatoe, Tugaloo, Brass Town, Cane Creek, Chehohee, Qualhatchee, Toxaway, Chittitogo, Sugar Town, Keowee, and others were destroyed. Andrew Pickens was leading a detachment of 25 men to destroy Tamassee when they were attacked by a large Cherokee force estimated at over 150 men and surrounded in an open field. The militiamen formed a small circle and fired out at the surrounding Indians in what came to be called the "Ring Fight." Pickens won the fight after being reinforced. Following the destruction of the Lower Cherokee towns, Williamson conducted a campaign into Georgia and North Carolina to destroy the Cherokee Valley Towns. Andrew Pickens was elected major for this expedition. Williamson's forces fought five battles with the Cherokees and destroyed 32 towns and villages in the Lower and Valley settlements. Major Pickens served in General Williamson's army in 1778 in a failed attempt to take British St. Augustine. In the spring of 1778, he was appointed colonel of the Regiment of Ninety Six South Carolina Militia. The British occupied Augusta and were recruiting loyalist troops in the western piedmont when Andrew Pickens' militia surprised and defeated a loyalist force of 700 men gathered at Kettle Creek about 50 miles northwest of Augusta. The British were forced to withdraw from Augusta and serious efforts by them to control the back country were suspended until the fall of Charleston in 1780. After Charleston was surrendered to the British, Andrew Pickens, along with many other rebel leaders accepted parole and British rule. When loyalists burned his home and plundered his property in late 1780, Pickens informed the British that they had violated the terms of his parole and he was rejoining the rebels. He was soon leading operations in the vicinity of Ninety Six and over to Georgia. Pickens co-operated well with Continental forces. He was in charge of the South Carolina militia at the Battle of Cowpens in January 1781. There, with Continental troops under General Daniel Morgan, the rebels won a great victory over British regulars commanded by Colonel Banastre Tarleton. Following the Battle at Cowpens, Andrew Pickens command worked with the Continental Army under Nathaniel Greene in North Carolina. After the Battle at Weitzel's Mill, Andrew Pickens' South Carolina and Georgia militia were called home from North Carolina to defend local rebel interests and missed the major battle at Guilford Courthouse. General Pickens worked with Colonel Elijah Clarke in harassing British forces in the area between Ninety Six and Augusta. The British in Augusta surrendered to Pickens, Clarke, and Continental troops under Colonel "Light Horse Harry" Lee in April 1781. The Star Fort at Ninety Six withstood a siege and attack by General Greene and the Continental Army in June. As Greene withdrew from Ninety Six, he instructed Pickens to harass the enemy and most importantly keep peace between the rebels and loyalists in the back country. In July the British destroyed the fort and village at Ninety Six and withdrew south. As the British withdrew, Andrew Pickens gave strict orders to his men to observe justice, and restore peace and order. He soon joined General Nathaniel Greene who was moving to attach the British under Lieutenant Colonel Alexander Stewart on the Santee River. At the Battle of Eutaw Springs on September 8, Pickens was shot off of his horse by a bullet which hit the buckle of his sword belt. He was not seriously wounded, but the wound troubled him in later years. The battle ended in a draw. In September, while General Pickens was recuperating from his wound, the Cherokees attacked settlements on the western frontier. With the withdrawal of the British Army, Governor Rutledge moved to re-establish civil government in South Carolina. In January 1782, Andrew Pickens became a member of the South Carolina General Assembly. Recovered from his wound, in March 1782, Pickens led a force again against the Lower Cherokees and burned several villages in Oconee County. In 1785, he met with the Cherokee at the Treaty of Hopewell where the Indians ceded their lands to the state. In 1787, Pickens moved to Seneca and his plantation at Hopewell. About 1802, he moved to the site of the former Cherokee Village Tomassee, near where he had the "ring fight" in 1776 and built a plantation which he named after the village. Pickens lived at Tamassee until 1817. He remained an elder in the Presbyterian Church and was the first United States congressman from the Pendleton District. [S670] Christopher S. Powell, online <http://www.my-ged.com/powell/>, Christopher S. Powell (e-mail address), downloaded 2004. [S671] Monroe Pickens, comp., Cousin Monroe's History of the Pickens Family (Easley, South Carolina: Kate Pickens Day, 1951), 40. [S677] North Carolina, The Colonial and State Records of North Carolina, Vol. XXIII (Raleigh: State Department of Archives and History, unknown publish date), 381. [S675] E.M. Sharp, Pickens Families of the South (Memphis, Tennessee: E.M. Sharp, 1963), 11-12, citing a photostatic copy of the original will made by the State Department of Archives and History, Raleigh, N.C. on Oct. 2, 1957. North Carolina Wills, Volume XXIV, page 42. [S674] Terry Pickens McLean, 2004, citing Lois K. Nix and Mary Kay Snell, Thomas Boone Pickens - His Ancestors; Wolfe City Texas, Hemington Publishing Company, 1989; pp 45-50, who cited Anson County, North Carolina, Will Book I, 1757, p. 115. [S675] E.M. Sharp, Pickens Families of the South, 12, citing Mecklenburg Co., N.C. Deed Bk. 2, pg 213. [S672] Bob Thompson, Gedcom, "Robert Miller Family File," to Laura M. Cooper (Arlington, Texas), 11 October 1998.